Taking 100 photos on one spot, provocative shots for the sake of likes, naked pictures of yourself; Russian psychiatrists believe the growing craze for selfies leads to pathological addiction and say that it should be designated a mental illness. As the craze for publishing self-portraits, or “selfies” as they have become known, continues to spread on social networks, a backlash is beginning to develop against a practice widely seen as narcissistic. Russian psychiatrists have now waded into the debate, arguing that not only is selfie-taking a sign of insecurity and self-centeredness, but in extreme cases it can also be considered an illness. Harmless at first glance, the desire to constantly share pictures of yourself in the anticipation of attracting “likes” from friends and admirers can lead to dependence and the necessity of psychiatric treatment. According to leading Russian psychologists, internet addiction could soon be classified as a mental illnesses, and then such a diagnosis will be given to those addicted to online games, social networks or selfies. However, for Lev Perezhogin, a senior researcher at the Federal Medical Research Center of Psychiatry and Addiction at the Ministry of Health of Russia, there is nothing intrinsically wrong with the act of taking a selfie. “A selfie is essentially a self-portrait," says Perezhogin. “Self-portraits were present in the work of almost every artist, this is self-expression." However, he explains, it can reach the stage at which a person cannot live without selfies, making a show of their every step. When taking and posting selfies becomes an obsession, then treatment is needed. "Doctors are now faced with a total enthusiasm for mobile devices in general, and selfies in particular," Perezhogin continues. "Selfies manifest themselves as a form of dependence on electronic devices. For example, a person cannot post photos when there is no internet and starts to experience withdrawal symptoms like they would with heroin. Of course, this is an addiction, and it should be treated, including with medication." Tripods for cameras, special selfie sticks, timers and cords – equipment manufacturers are led by the customer, and the demand for such products is growing. 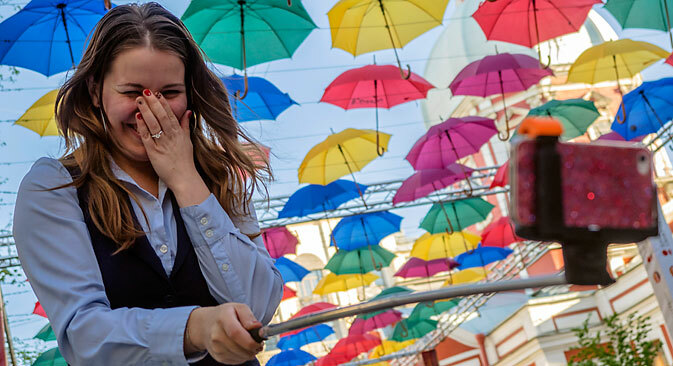 For instance, some Moscow parks are considering opening selfie-stick rentals for visitors who have left theirs at home or did not want to take along extra equipment. Psychologists note that it is young people aged 13 to 30 that are the most vulnerable to selfiemania, predominantly girls, who like to take group selfies in addition to individual ones. Many are inspired by celebrities from the worlds of politics and show business, who are happy to share their selfies with fans. Candid photos of celebrities taken in the mirror are no less popular – these also find their way onto the web, sometimes with the help of hackers. “You can't surprise anybody with a naked photo now; unfortunately, in the pursuit of ratings [“likes”], young people photograph themselves in front of a burning building, people fighting or a car accident," says psychologist Olga Peshkov. "But there are also those who simply do not have enough attention and communication, and then they start to post their pictures in front of food, a cabinet, or a shower." This desire to catalogue one's every step is resulting in social networks being flooded with mundane selfies – a result of the disorientating nature of a world that places a premium on the quest for identity, according to Lev Perezhogin. "We live in an age of self-centeredness, people do not understand either their social role or personal affiliation, hence the search for experiments," Perezhogin suggests. "Hence the desire to change jobs 10 times, to change your partner 20 times — the eternal search for personality, to understand who you are and why you exist. In the course of the search for identity, narcissism arises — the desire to look at ourselves, to put ourselves on display and get the approval of others." The universal selfie craze has already led to some prohibitions, as the editor of U.S. magazine Vogue imposed a taboo on selfies at the Costume Institute Gala, while the director of the Cannes Film Festival banned selfies on the red carpet. A number of leading museums around the world have also introduced bans on visitors photographing themselves. Selfies are not allowed at London's National Gallery, New York's Museum of Modern Art and the National Gallery of Australia, while in Russia, a ban on selfies has been imposed by the State Tretyakov Gallery in Moscow.